When I was at the MSC event last weekend admiring all of the cool-looking drift cars, I noticed a black JZX100 Mark II that looked a little familiar. I had never seen the car at a drift event before, but being a big fan of the JZX chassis, I clearly remembered seeing the car at a grip event at Tsukuba Circuit back in March of this year. It was built by Car Make Rasty and you may have seen a photo of this car in my 101 post about the JZX series. 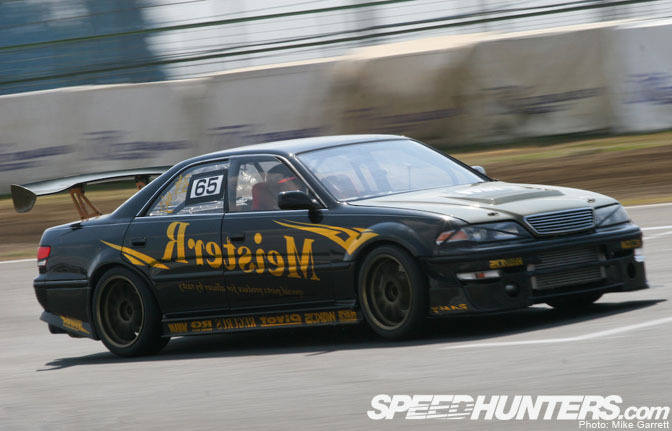 Just looking at the car, you can tell that it is a bit different from the typical JZX drift cars you see in Japan. The car’s aero parts are of a different style than those usually seen on drift cars, and the car’s vibe just screamed “function”. As I watched the car first take to the course at Honjo, I wondered how it would do. After a few quick runs to get a feel the course, the driver swung out the tail and the car ripped through the corners sideways with smoke pouring from the rear tires and the air filling with the sound of Toyota inline six goodness. Watching the car make its practice runs and seeing the ease in which it could smoke the rear tires, the Rasty JZX100 could easily be mistaken for one of the top D1 cars. Obviously this car is more than a one trick pony. I took this photo as the car was finishing up its run on the final part of the course. While most of the lesser powered cars would finish their runs at this point, the Mark II would continue the drift all the way down the back straight with plenty of manji thrown in for extra style points. This shot also is a good place to look at the car’s unique aero parts. The front bumper, side skirts, and rear mud guard are all from Rasty’s Meister R GT-Spec series and they have a noticeably different look then something like a BN Sports kit. As you would expect, these parts were also developed for use in time attack events. All the other exterior parts are also from Meister R and include FRP doors, the GT wing, and a carbon kevlar hood and trunk. All of these parts help to trim weight from sedan’s larger chassis and I really liked how the hood looked in particular. This car did not ride nearly as low as say, the cars from Team Magician, but it still had a nice stance and it had obviously been set up for drift use quite well. A look at the spec sheet shows that the car is running Meister-R-spec Aragosta coilovers with Swift springs. Other suspension parts include a lower brace kit from TOMS and sway bars from a company called Largus who’s parts can be see on many pro drift cars in Japan. The Brake upgrades include a set of F50 calipers in the front and OEM JZA80 Supra calipers in the rear. The rotors are two-piece units from RDD and the pads are Endless. For grip use, the car usually runs a set of 18×9.5 +15 Volk CE28N’s all around, but at the MSC event it was running a pair of less aggressive mesh wheels in the front. If you look under the hood, you might think you are seeing a standard 2.5L 1JZ powerplant, but actually the block comes from 3.0L 2JZ making this the so called “1.5JZ” hybrid engine. Other engine tuning includes an HKS V-cam setup, SARD 800cc injectors as well as a nitrous kit for added juice. On the turbo side of things, the car is equipped with an HKS 3040 turbine with an original Rasty exhaust manifold. The exhaust system itself is also an original titanium set up from Meister R. Power output is estimated to be in the 600ps range. And here you see all that engine tuning being put to use as the rear end of the car becomes engulfed with tire smoke. If MSC was judged on smoke production alone, this car would have easily walked away with the victory. It was just awesome to see this car running the course and the crowd seemed to love it as well. This car’s race car-like build quality is obvious when you look in the interior. Almost all signs of the original Mark II interior are gone, and in its place is number of race-spec parts like the full bucket seats, which are also from the Meister R catalog. When I looked inside the car, I expected to see a sequential transmission, but the car is actually running a standard 5-speed manual from a JZX110. The power than goes to a Tomei Technical Trax Advance LSD planted in the rear differential. Here is a better look at the custom dashboard which is filled with a number of custom gauges from PIVOT. The Meister R original steering wheel measures 330mm and the roll cage is 13-point setup from Safety 21. Again, very racecar-like. Here is the same car running at Tsukuba earlier in the year at one of the Amuse circuit meetings. In 2005 this car became the fastest four-door rear wheel drive car at Tsukuba Circuit with a lap time of 59.6 seconds with Tarzan Yamada behind the wheel. Recently though, the car has been shifting to drift use and it has been seen in a couple MSC events this year. 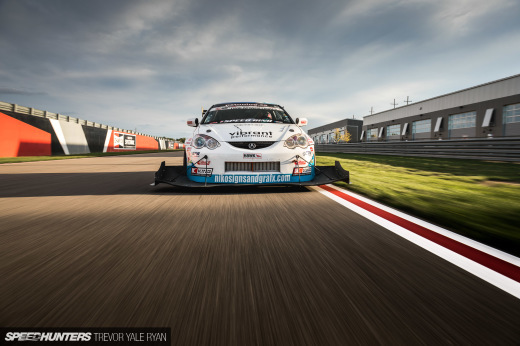 In the end, with this car Rasty has proven the same machine can be very successful in both drifting competition and in traditional grip racing. Even for a more “universal” platform like a Silvia, being able to do well at both is feat worthy of applause, but doing it in a big four-door sedan is even more exciting. In a way it reminded me of the Signal R34 GT-R which has seen action as a drag car, a time attack car, and most recently as a drift car in Formula D. The Rasty JZX100 was certainly one of my favorite cars at the MSC event, and I know it will be very interesting to watch how this car continues to evolve in the future. Yeah I second that. I luv it also! The steering wheel is my favorite part. This car is sweet!